Don’t Forget to Fill Out a Tracking Form for Your Plant or Organism! When did you first notice the plant? Have you seen the plant in the lake in the past? Has it grown at a rapid rate? If growing in a clump or patch, how large an area does it cover? Is the plant growing in more than one location in the waterbody? If you think you have found one of the eleven target invasive aquatic species in your lake, please contact the LSM at (207) 783-7733 or stewards@lakestewardsme.org. Be prepared to give a brief description of the plant in question. You may be asked to collect a sample of the plant and send it to the LSM for identification. 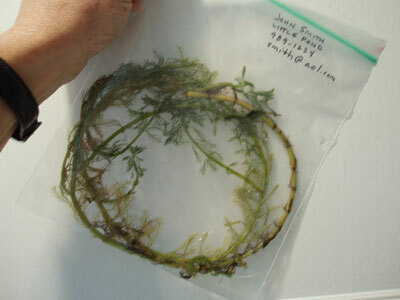 When collecting samples from a live lake plant, please be sure not to remove the whole plant. Snip off one or two pieces of healthy stem from the plant (roughly 8 to 12 inches long) including as many different features as you can (flowers, fruits, leaves, etc.). For rooted floating leaved plants, be sure to include as much of the stem as possible. 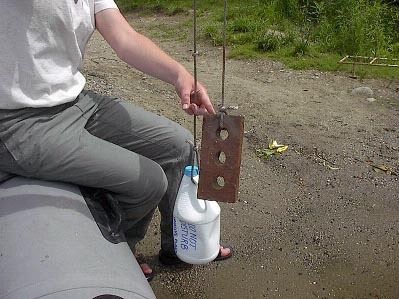 Mark the location of the plant with a weighted buoy. 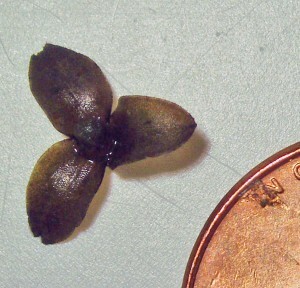 In the event that your plant is invasive, this will help the DEP quickly locate the infestation and take proper action. If possible, mark the location on a map. A map of the waterbody may be available on our Lake Pages. If the plant is covered with algae or tangled in debris, remove as much of the unwanted material as possible, without damaging the specimens. Keep the specimen in water, in a cool place such as a refrigerator. This will keep it fresh until you are ready to photograph or ship. IMPORTANT: Depending on the plant, a photograph may not be adequate. We may need to see the physical specimen, so please do not discard it until you hear from us, and be sure to keep it fresh as described above. Many plants can be identified from a sufficiently high resolution, good quality photograph. Below are directions for submitting a plant via digital photo as well as through the mail. Float the plant in a tray of water long enough to stretch the sample out fully, with enough water for the plant to float freely. The tray bottom should be white (or clear and placed on a white surface). Put something in the photo/s to show scale e.g., a ruler or coin. Take a high-resolution digital picture. The image must be in focus and show the greatest amount of detail possible. Adjust lighting to minimize glare. If possible, take close-ups of specific features, such as individual leaves, a single whorl of leaves, flowers, fruits or other structures. Send the image/s by email to stewards@lakestewardsme.org. Write “Plant ID” in the subject line. Include the following information in the body of the message: your name and contact info, waterbody name and town, and date the plant was collected. Complete our online Suspicious Plant Form. 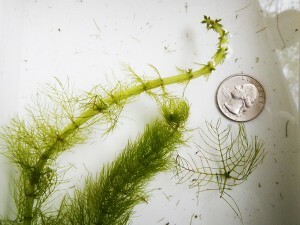 This will alert LSM staff to the fact that you have submitted photo/s via email, and provide us with the information needed to record your find in the statewide aquatic plant database. The staff is often out in the field during the summer, and it is important that someone be here to receive and process your plant properly. 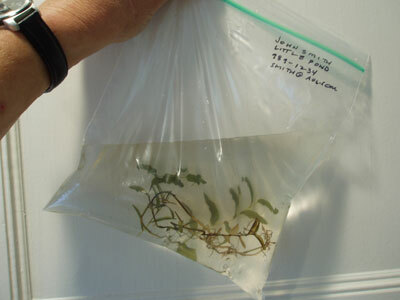 Place wet specimens a water-tight plastic bag, (e.g., Ziploc). Sturdy plant sample packed wet, but without additional water. Remove air from the bag before sealing. If the plant is relatively sturdy, remove all air from the bag and seal (see left photo, above). DO NOT wrap the plant in a wet paper towel or other absorbent material. If the plant is delicate and/or flimsy, add enough water to the bag to cushion the plant and keep it wet (see right photo, above). Make sure the bag is sealed tight and place it in a small box with enough packing material to prevent movement. DO NOT use padded envelopes to mail bags with water! Fill out and include a Suspicious Plant Form in the box with the specimens. This information is critical to tracking plants sent in for identification, and ensuring a timely response. If you need help filling out the form, call us at 207-783-7733. Plants should be shipped early in the week. Plants mailed later in the week may arrive on Saturday, when no one is here to process them. Please contact LSM at (207) 783-7733 or stewards@lakestewardsme.org to let us know the specimen is on its way. We will be looking for it. We will contact you within 72 hours of receiving your plant sample. We will identify the plant and confirm whether or not it is an invasive species. If the plant is invasive, the Maine Department of Environmental Protection will be notified, and a rapid response action plan will be initiated.